The Iveagh Markets on Francis Street, Dublin. DUBLIN CITY COUNCIL has voted to take over ownership of the historic red-bricked Iveagh Markets, a Victorian building which has been derelict for the last 20 years. The markets, located in the Liberties and built by the Iveagh Trust in 1890 and closed in the 1990s, was bought by hotelier and publican Martin Keane. 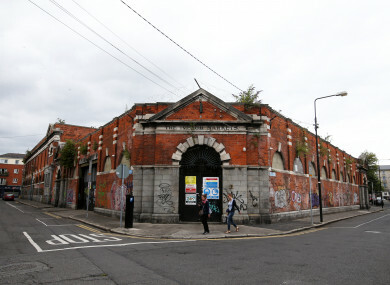 It had been reported that Keane would overhaul the derelict building and bring it back into use again as a marketplace. But after various development delays, work had stalled on the site. In a vote held late last night, it was confirmed to TheJournal.ie that councillors had voted in favour of beginning a process to take back ownership of the Iveagh Markets. Keane, who still wants to stay with the redevelopment project, is quoted as telling the Irish Times that he’ll “go to war” over the Iveagh Markets. A peak at the inside of the Iveagh Markets derelict building. Rebecca Moynihan, a Labour councillor for Crumlin-Kimmage says that Dublin City Council has voted to take back ownership of the building because for the past 36 months, Keane ”didn’t do anything” with the building, which is in dire need of repair. She says that now Keane’s project has run into financial trouble, he wants the state to pay towards the buildings refurbishment – the figure previously reported was €35 million. “He’s admitted that he wants state intervention and then he wants to be the one to own it,” the Labour representative told TheJournal.ie. He’s had his chance, he’s promised things for 20 years and hasn’t fulfilled them, so he’s frustrated the contract with us. Moynihan added that she thinks Keane should “just walk away” from the project, but he “can go and fight for it” if he wants. Other than that, it’s all a bit unsure what will happen next to the building that’s in dire need of repair: will it stay in the council’s control or be sold off to a private company again? “We don’t know yet,” Moynihan says. This article was updated at 3pm to include the councillor’s comments. Email “Dublin City Council votes to take over iconic Iveagh Markets”. Feedback on “Dublin City Council votes to take over iconic Iveagh Markets”.